Please select the favoured pack size. Product information "Collagenase Type III (EC 3.4.24.3)"
Clostridium histolyticum collagenase is an enzyme mixture of collagenase, clostripain and tryptic and proteolytic activities. Collagenase type III shows normal Collagenase, but very low proteolytic activity. 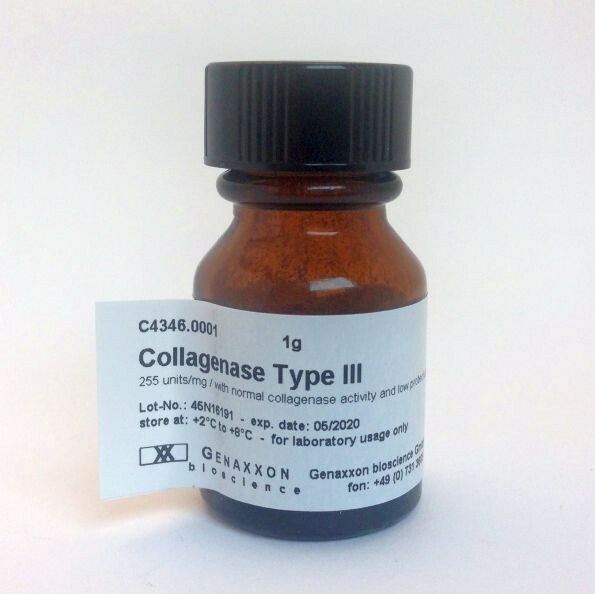 Type III Collagenase is recommended for preparation of cells from mamary gland and fetal cells and has a specific activity of 100 to 250 Mandl units per mg of dry matter. specificity studies have demonstrated that the colG gene prefers natural substrates such as intact collagen, compared to the colH gene product which preferentially digests short synthetic substrates (FALGPA) (Eckhard et al. 2009 and Matsushita 1999). The treatment of tissue with collagenase causes the careful, selective degradation of the intercellular matrix, and does not affect the growth of the cells. The collagenase offered by Genaxxon bioscience is a mixture of different proteolytically active enzymes and requires calcium ions for both the catalytic activity and the binding to the collagen molecule. In contrast to vertebrate collagenase, Clostridium histolyticum collagenase digests native triple helix collagen into small peptides, which is the major use of collagenases in cell culture application. For optimal results, a well balanced mixture of proteolytic enzymes is necessary. Four different collagenases, Collagenase Type I >, Collagenase Type II >, Collagenase Type III > and Collagenase Type IV > are available for this. Type IV is usually used together with other enzymes, such as trypsin >, elastase or hyaluronidase >. Trypsin or Trypsin/EDTA > conventionally used in the cell culture degrades the matrix only slowly and can cause irreversible damage to the released cells. Therefore, we recommend Accutase > instead of trypsin or trypsin/EDTA. Clostridium collagenases belongs to the metalloproteases, a large family of proteases that shares a zinc-containing motif at the center of the active site (Gonzales and Robert-Baudouy 1996). The enzyme is reversibly inactivated at high pH values and irreversibly inactivated at low pH values. Inhibitors of collagenase include cysteine, EDTA, o-phenanthroline, 8-hydroxyquinoline-5-sulfonate, bipyridyl, 2,3-dimercaptopropanol or Hg2+, Pb2+, Cd2+, Cu2+. Collagenase is NOT inhibited by diisopropylphosphorofluoridate (DFP) or serum. Lyphilised Collagenase should be stored at +2°C to +8°C and remain stable without loss of activity for at least three years. Enzyme should be protected from moisture. Dissolved Collagenase can be aliquoted and stored at -20°C for one year. Conversion rates of collagenase activity units: 1 PZ U/mg ~ 3.9 FALGPA U/mg - 1 PZ U/mg ~ 1000 Mandl or CDU U/mg - 1 PZ U/mg ~ 10 HP U/mg (PZ-units according to Wünsch). More products around "Collagenase Type III (EC 3.4.24.3)"
Our comment on "Collagenase Type III (EC 3.4.24.3)"
Very low proteolytic activity, normal collagenase activity. Specific activity: >125 units/mg dry weight. Recommended for cell preparation of mammary and fetal cells. Here you will find information and further literature on Collagenase Type III (EC 3.4.24.3). For further documents (certificates with additional lot numbers, safety data sheets in other languages, further product information) please contact Genaxxon biosience at: info@genaxxon.com or phone: +49 731 3608 123. Customer evaluation for "Collagenase Type III (EC 3.4.24.3)"